Computerized tomography (CT), is a 3D imaging test design to create a detailed rendering of blood vessels, soft tissues, internal organs, and bones. These images can be reformatted on various places and turned into a 3D image that can be printed or digitally viewed. i-CAT is an award winning cone beam 3D dental imaging system. Dr. Kronquist uses the i-CAT to create incredibly accurate models of your face to ensure you get precise, quality dental treatment. The i-CAT was designed to assist in providing data for implants, wisdom teeth extractions, impactions, TMJ treatment, full facial and 3D images, and sleep apnea diagnosis. What are the features of the i-CAT? The i-CAT makes visualizing your jaw and face not just simple, but also incredibly detailed. These detailed images allow the dentist to plan out your entire treatment process without having to worry about worse case scenarios, which are common when you can’t see beneath the skin’s surface. Additionally, the i-CAT allows your dentist to easily share data with you so that you’re constantly informed and can make decisions about your treatment with your provider. How is the i-CAT used in dentistry? The i-CAT is utilized in a variety of ways. It can help determine where nerves are located and can give you an inside look at the actual jawbone, so you can see how healthy it is. This makes complicated and invasive procedures like dental implants much easier because the exact size and placement of implants can be determined ahead of time. What is the i-CAT machine like? The i-CAT machine is different than other imaging machines in that it does not require you to be enclosed. This means that if you suffer from claustrophobia you can still go through the imaging without suffering a panic attack. Additionally, the i-CAT is totally painless and create clear images in under a minute. In fact, one 20 second scan could be all the doctor needs to get the images and visualize your anatomy. How is an i-CAT scan performed? This quick and simple scan is performed by having the patient sit in a seat. It’s important that the patient is still while the scan is happening. 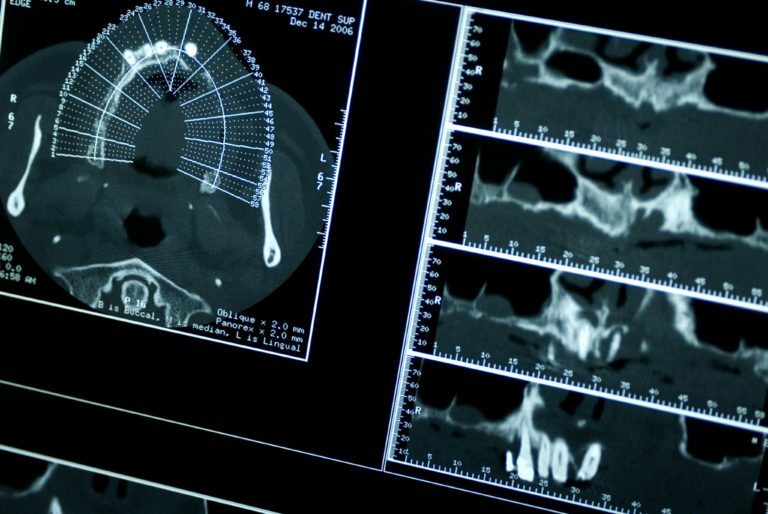 As the scan is happening the cone beam is used to take hundreds of pictures of your face that are then compiled into an exact 3D image of your face and jaw. Your dentist can then zoom in and out of the images to get the details needed to map out your diagnostics and treatment. This machine helps decrease the cost of treatment, improves the final result of your surgery, and can minimize recovery time. Patients that are in need of more invasive dental procedures or simply want to have a complete picture of how a dental procedure will be performed would benefit greatly from the i-CAT. Contact our team at Sunset Dental Group to learn more about this scan and to schedule an appointment. Our team is made up of compassionate individuals dedicated to providing you with the best treatment possible.